Concurrently, on view in the Thinkspace project room is Hanging Valley featuring new works by Portland-based artist, illustrator, and designer, David Rice. Inspired by the potential of unlikely pairings, Rice pushes the limits and boundaries of the physical world through his imagery, accessing a lawless surreal in which patterns merge with physical spaces, human and natural worlds intermingle, and the scale of site and place slide. 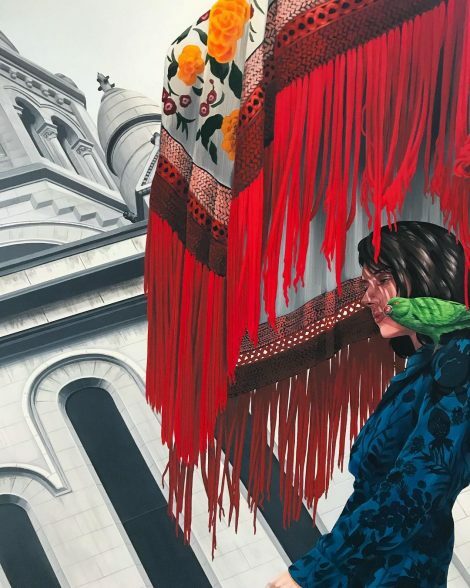 A gifted realist painter, Rice’s works combine beautifully rendered flora and fauna with references to cityscapes, architectures, graphic motifs, natural phenomena, and patterns. The juxtaposition of these elements transforms Rice’s visual universe into one of fantasy and experiment. Things that shouldn’t coexist together plausibly do, and the viewer is offered new entry points into otherwise familiar objects and spaces, invited to see them anew through a less restrictive framework and encouraged to forge new relationships to the subject matter. Rice’s creative free association supports these subtle, and at times not so subtle, shifts in reality. Protean and expansive, his environments are close enough to the real to feel familiar and far enough away to feel transporting and completely unknown.